My build is based on this Excel spreadsheet, EMDrive Calculator, that Roger Shawyer assisted with suggestions for how do various calculations. Originally the build was to replicate the Flight Thruster. Big problem was the cost and range of 3.85GHz Rf amps. Build is now focused on a 2.45GHz design that can be powered by a range of low cost WiFi Rf amps. The use of the EMDrive Calculator and feedback from Roger Shawyer has enabled me to better understand the relationships between the 3 frustum dimensions, Df, power and generated thrust. 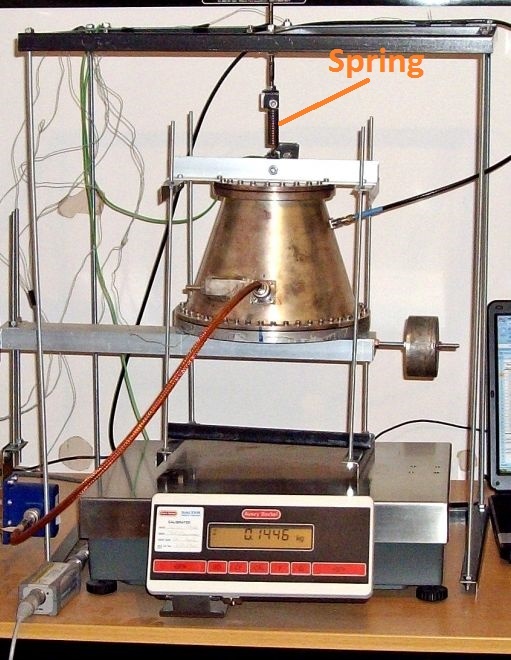 My test rig will be suspending the EMDrive from a spring then directly on a digital 1kg scale that can measure in 0.001g increments as Roger Shawyer did when measuring the thrust from his Flight Thruster. I believe this is the simplest method to accurately measure EMDrive thrust, especially when the EMDrive weighs more than the scale can handle. This page was last edited on 19 June 2015, at 20:28.